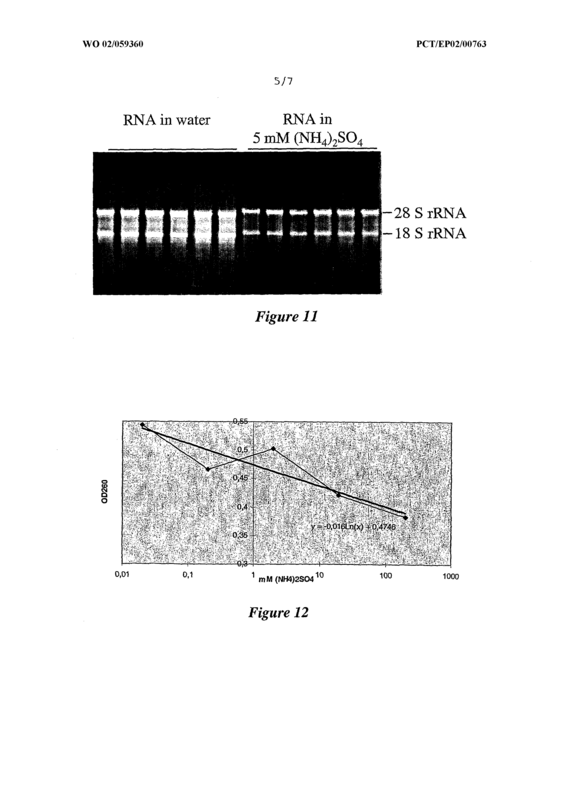 Ribonucleic acid (RNA) is a substance synthesized biologically and synthetically. 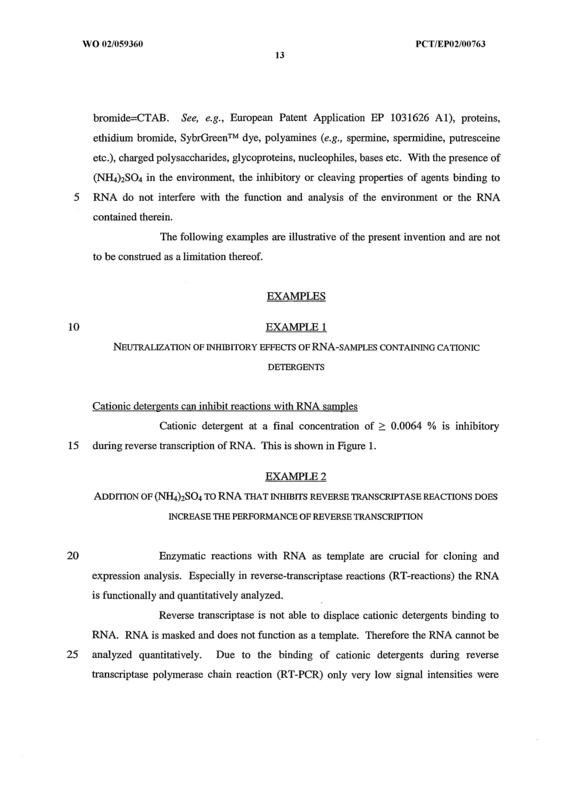 RNA serves many functions as information molecules, reaction substrate, reaction catalyst, recognition element, structural element etc. 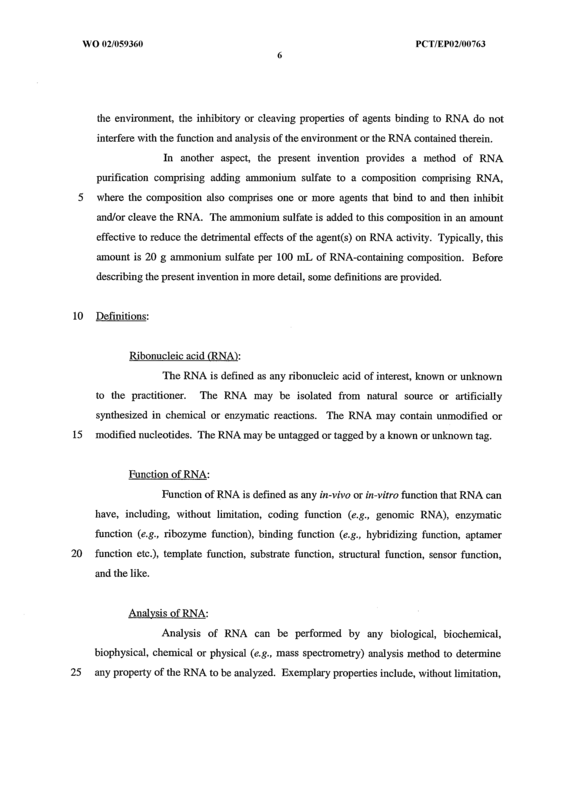 For most analysis methods and functions concerning RNA itself or RNA as an analysis tool the purity of RNA is important. 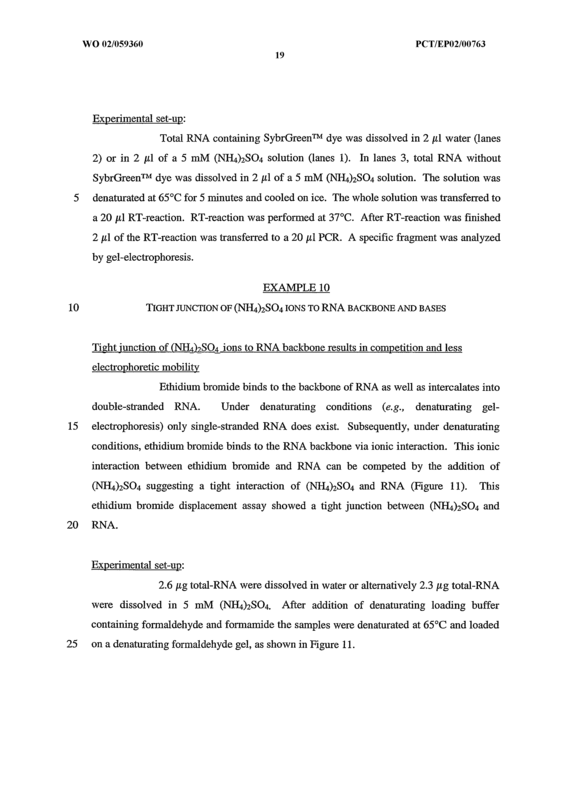 That means that e.g., other molecules which bind the RNA are able to inhibit the analysis/function of/using the RNA molecule or destroy the structure of the RNA molecule. 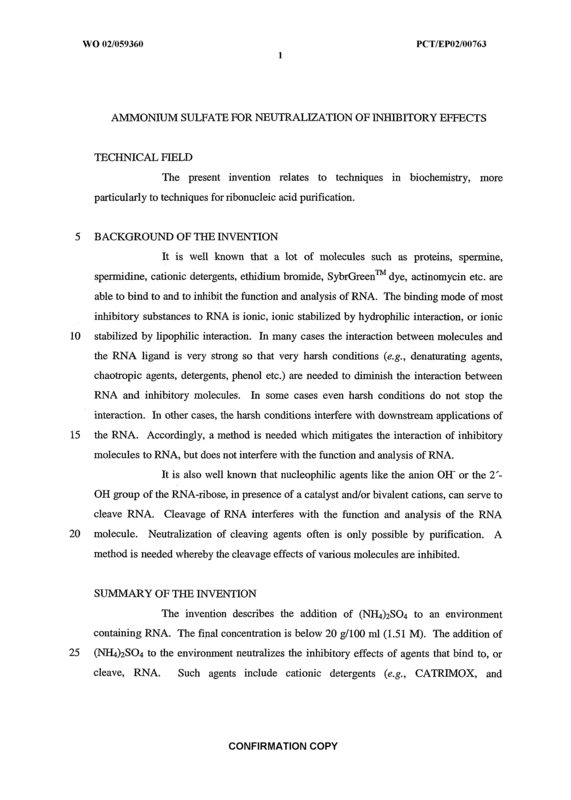 For this reason it is important to eliminate the inhibitory or destroying function of molecules binding to the RNA. 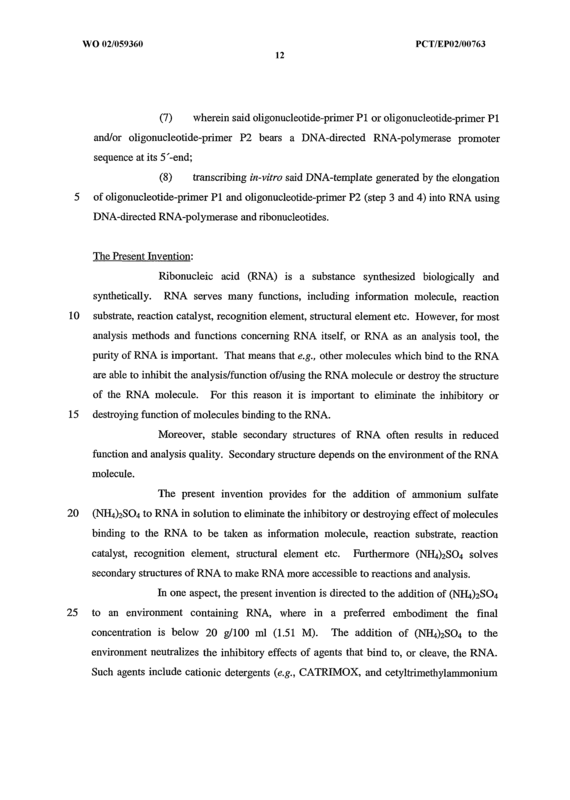 Moreover stable secondary structures of RNA often results in reduced function and analysis quality. 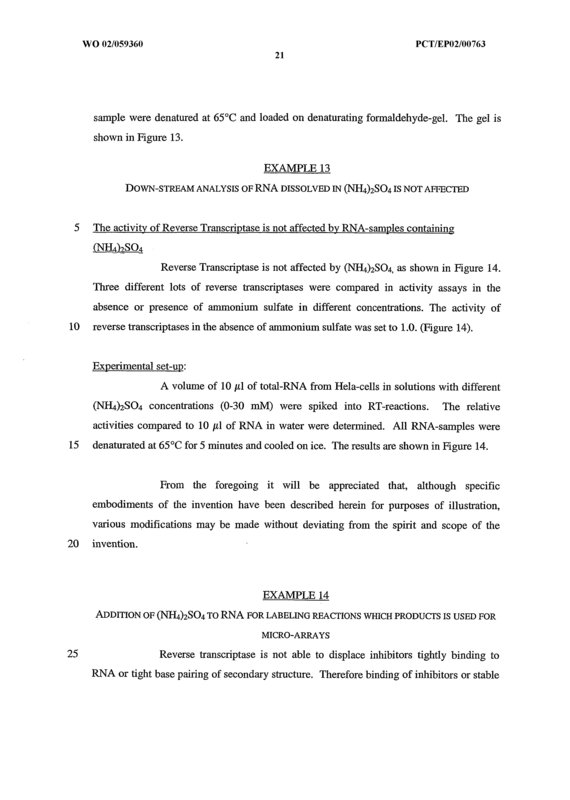 Secondary structure depends on the environment of the RNA molecule. 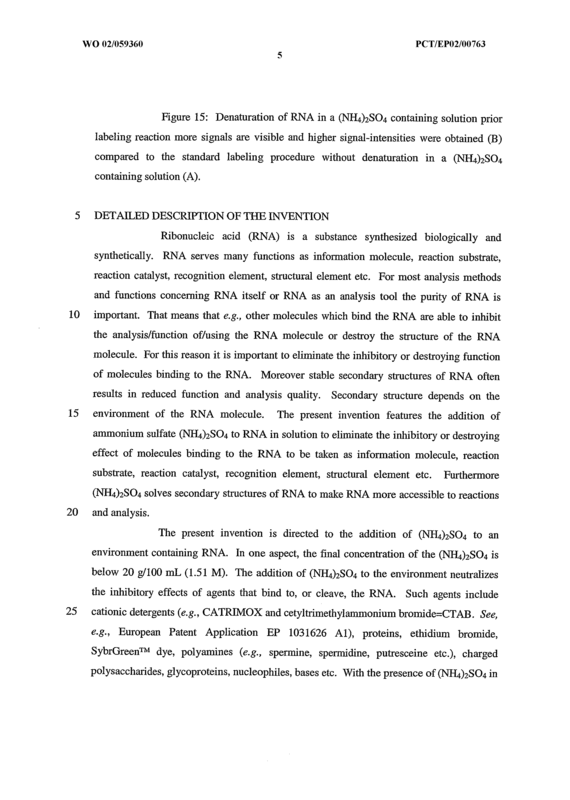 The present invention features the addition of ammonium sulfate (NH>4<)>2<SO>4< to RNA in solution to eliminate the inhibitory or destroying effect of molecules binding to the RNA to be taken as information molecule, reaction substrate, reaction catalyst, recognition element, structural element etc. 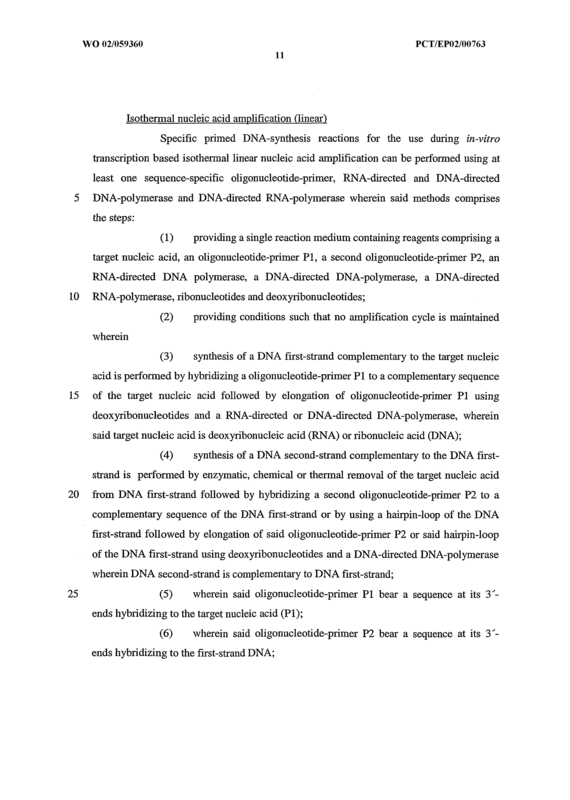 Furthermore (NH>4<)>2<SO>4< solves secondary structures of RNA to make RNA more accessible to reactions and analysis. 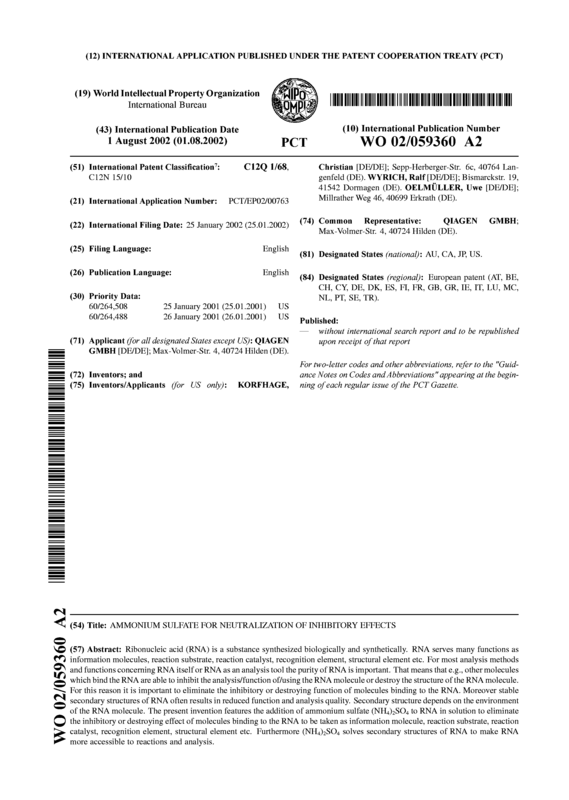 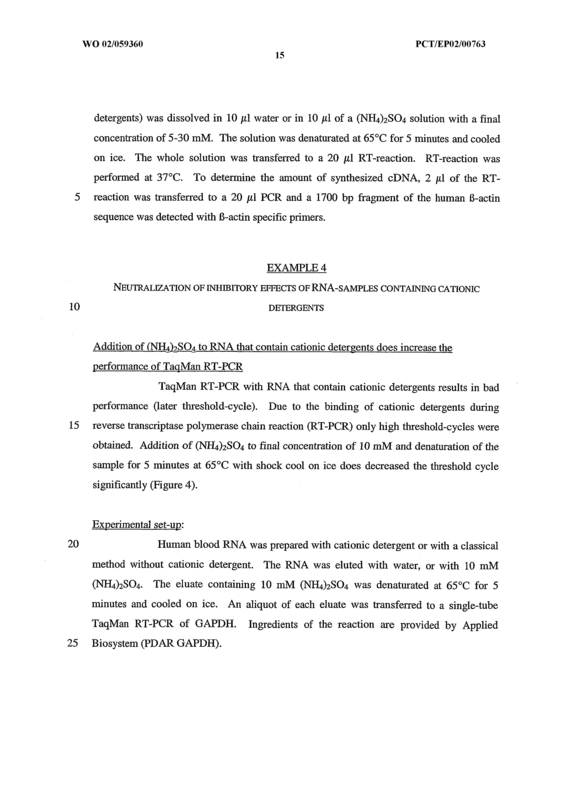 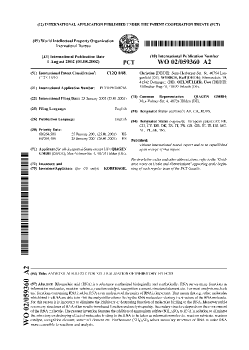 A method of RNA purification, comprising adding ammonium sulfate to a composition comprising RNA, where the final concentration of ammonium sulfate in the composition is below 20 g / 100 mL. 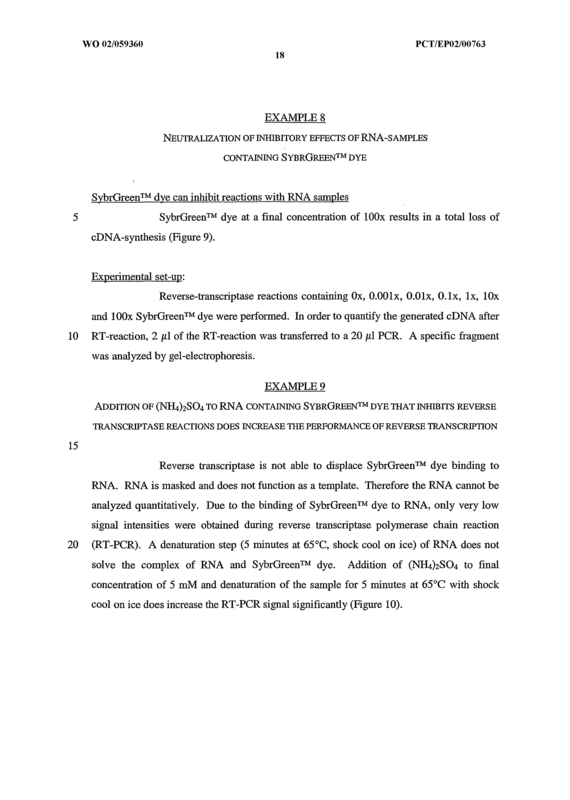 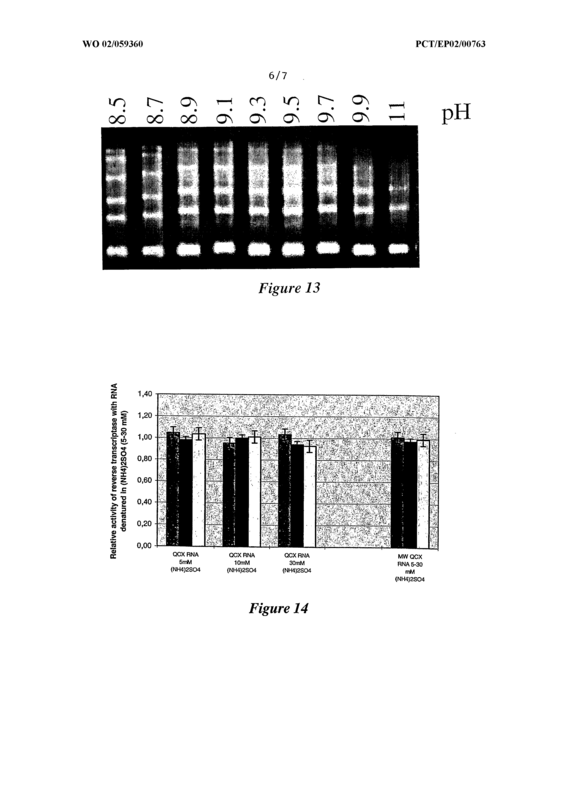 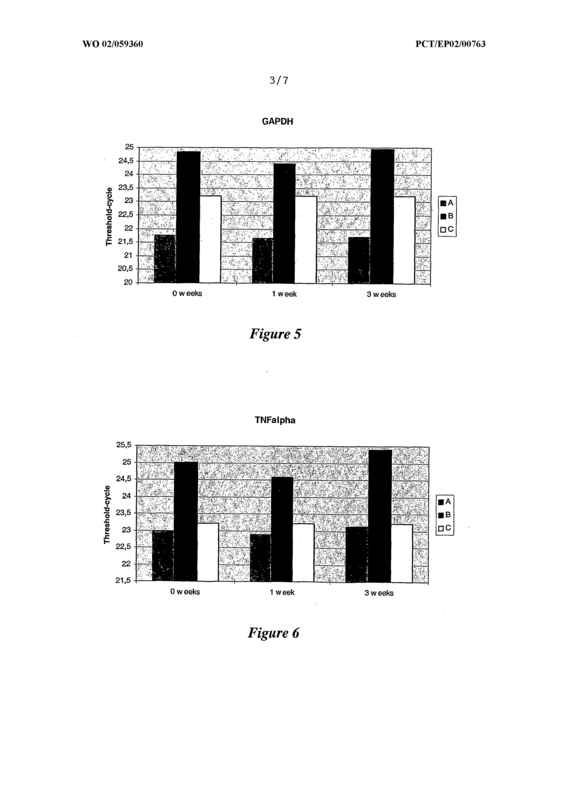 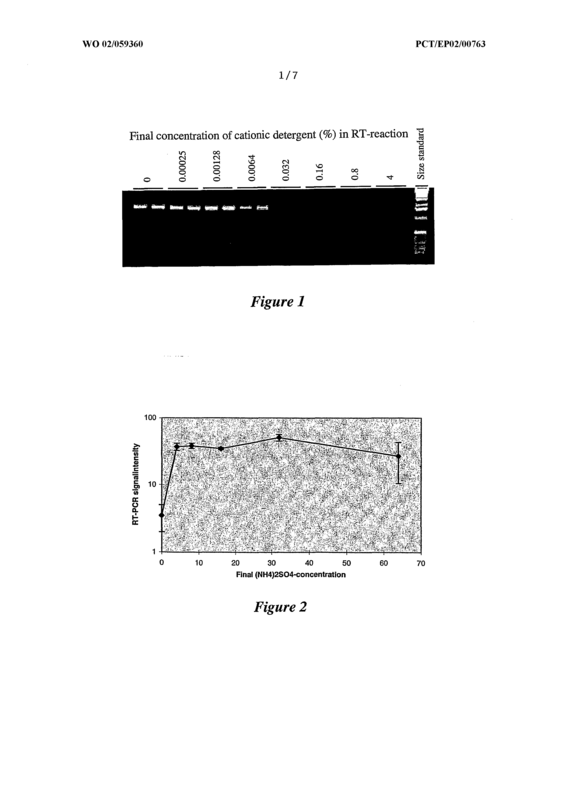 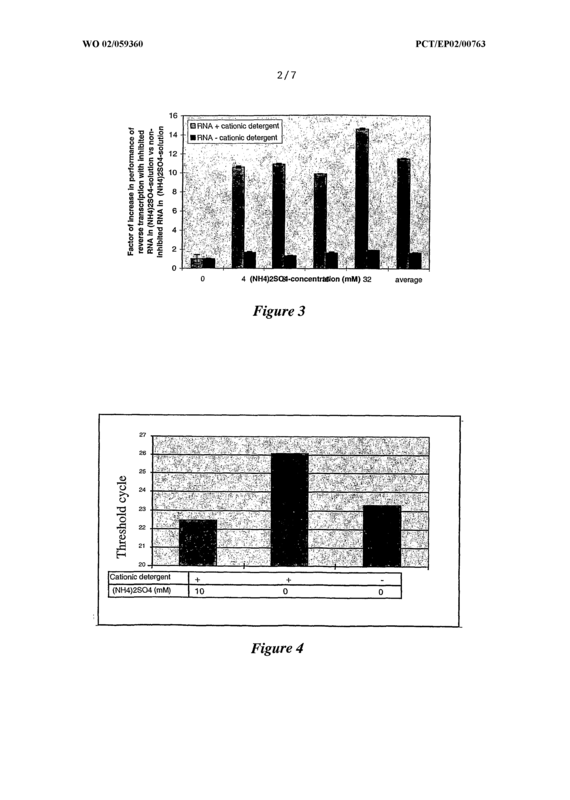 A method of RNA purification, comprising adding ammonium sulfate to a composition comprising RNA, where the final concentration of ammonium sulfate in the composition is about 1-64 mM. 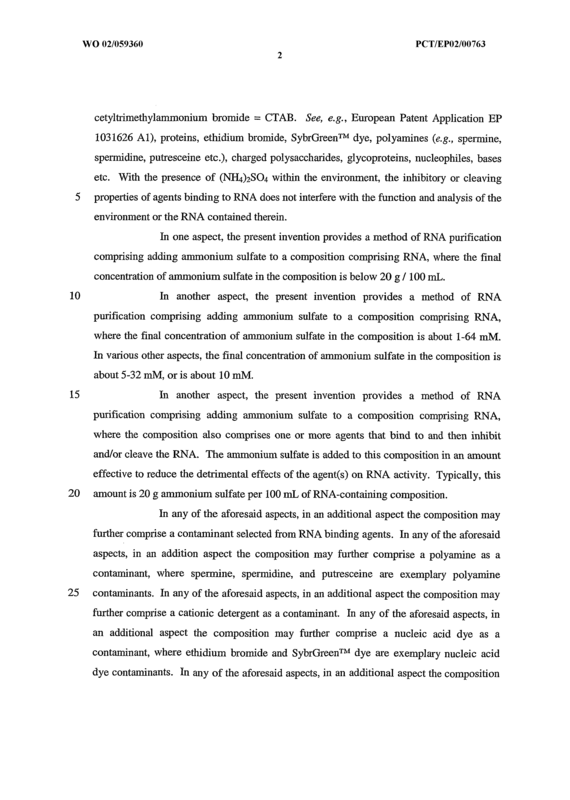 A method of RNA purification, comprising adding ammonium sulfate to a composition comprising RNA, where the final concentration of ammonium sulfate in the composition is about 5-32 mM. 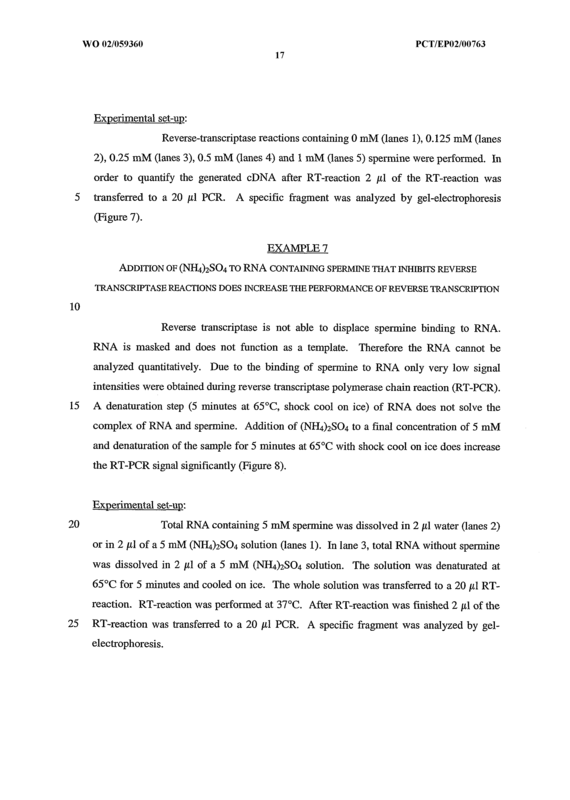 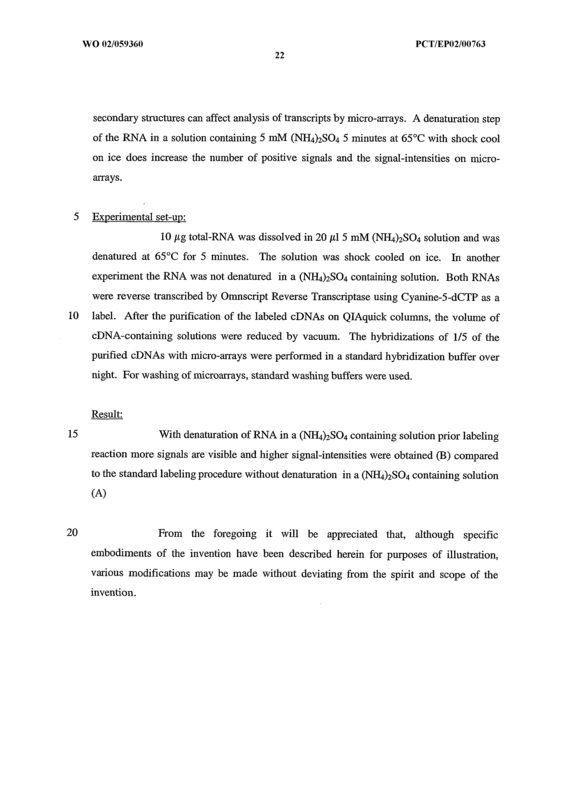 A method of RNA purification, comprising adding ammonium sulfate to a composition comprising RNA, where the final concentration of ammonium sulfate in the composition is about 10 mM. 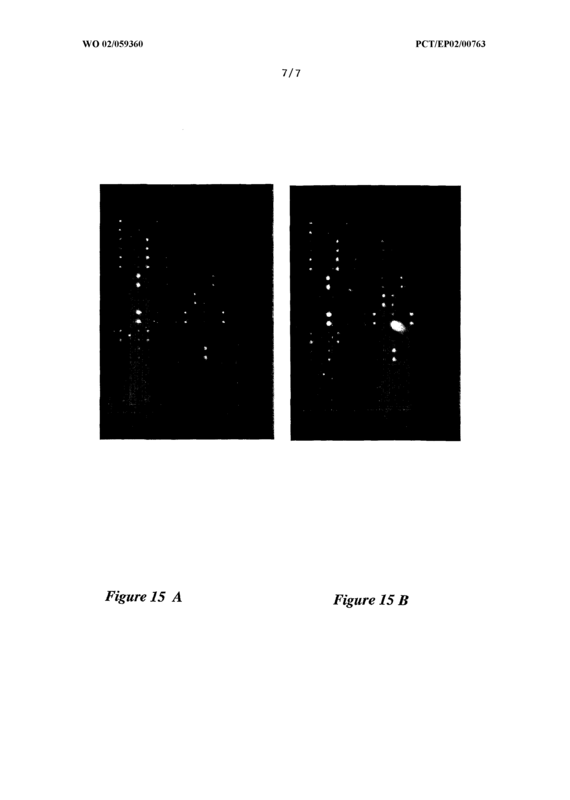 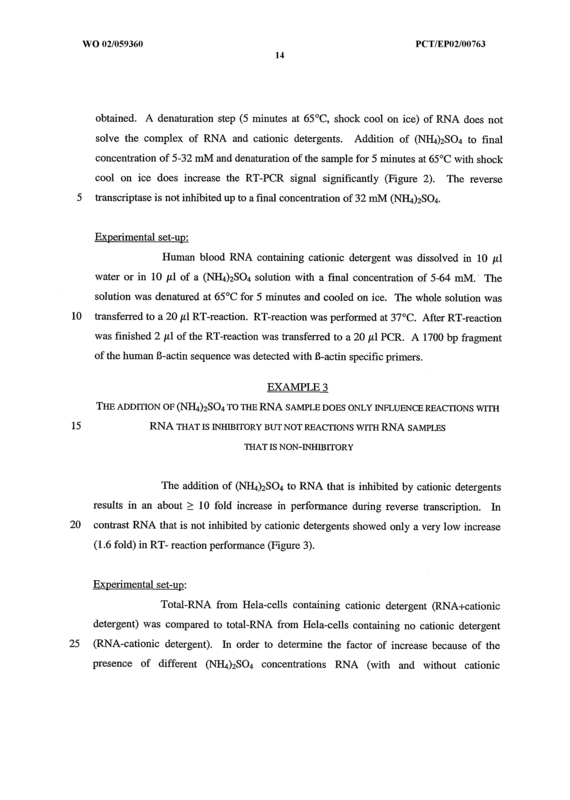 The method of any one of claims 1-4 wherein the composition further comprises a contaminant selected from RNA binding agents. 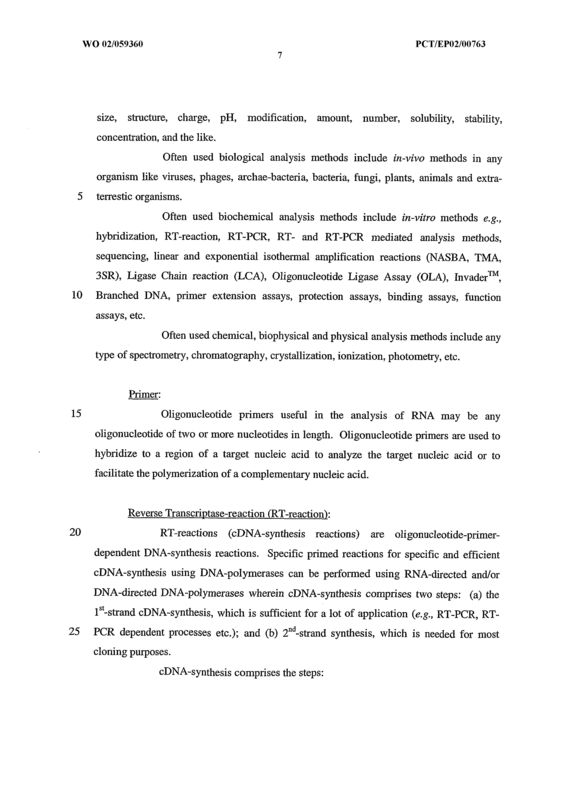 The method of any one of claims 1-5 wherein the composition further comprises a polyamine as a contaminant. 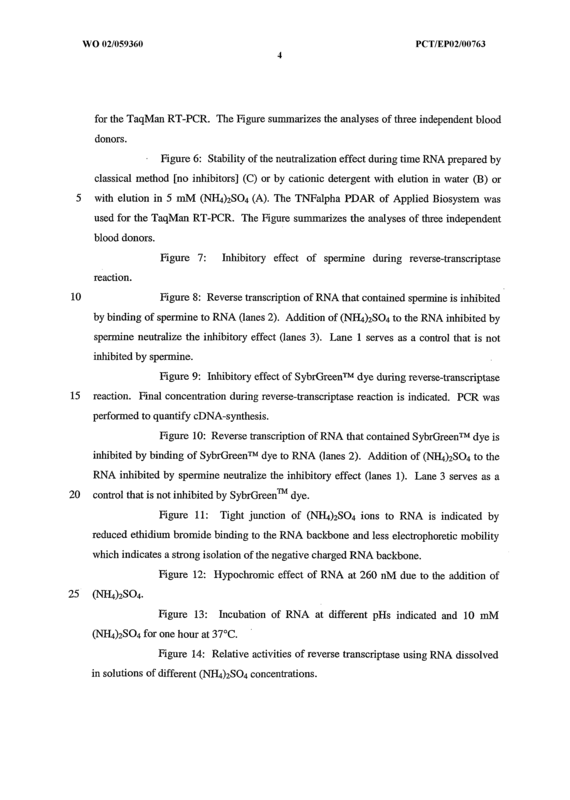 The method of any one of claims 1-6 wherein the polyamine is selected from spermine, spermidine, and putresceine as a contaminant. 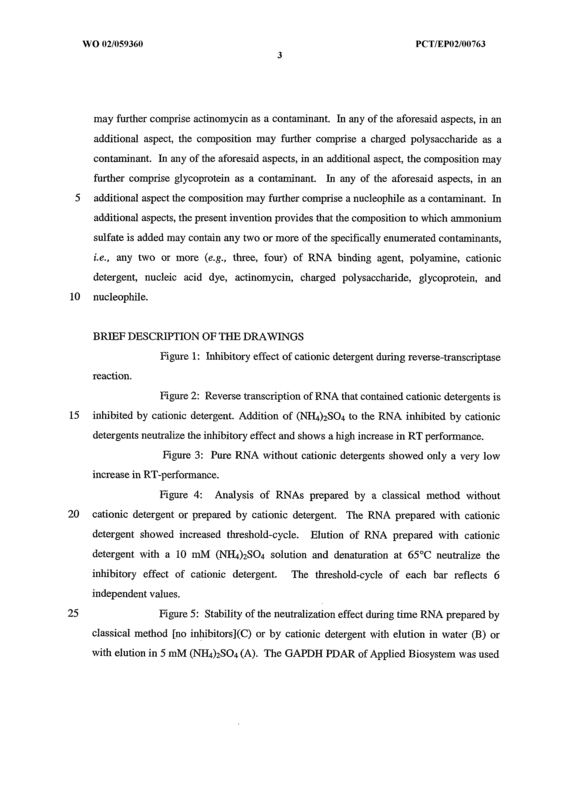 The method of any one of claims 1-7 wherein the composition further comprises cationic detergent as a contaminant. 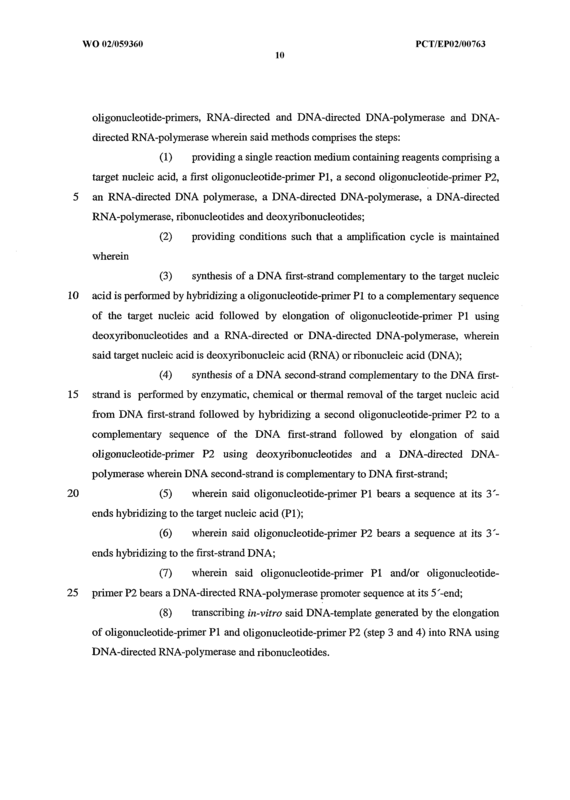 The method of any one of claims 1-8 wherein the composition further comprises a nucleic acid dye as a contaminant. 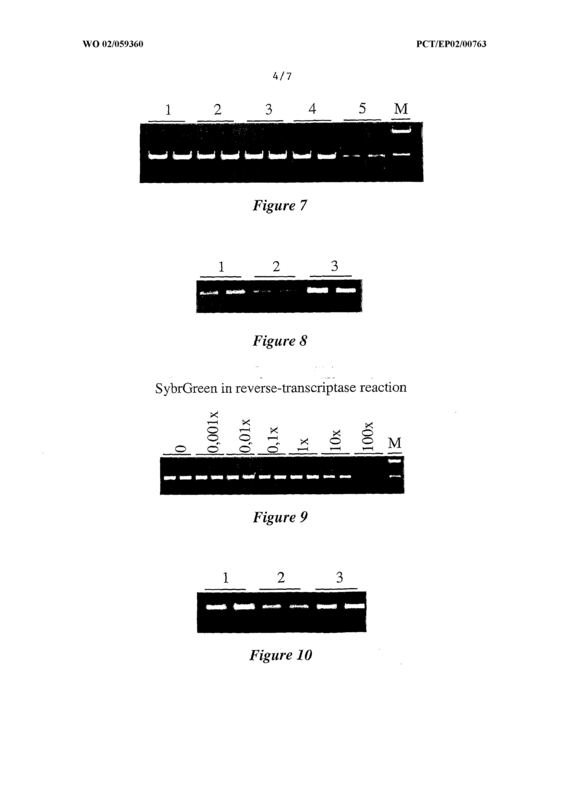 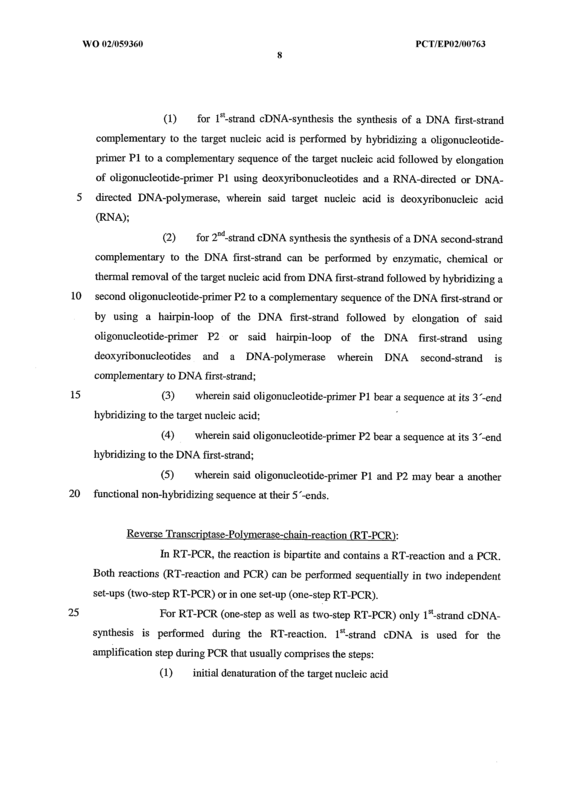 The method of claim 9 wherein the nucleic acid dye is ethidium bromide or Sybr Green™. 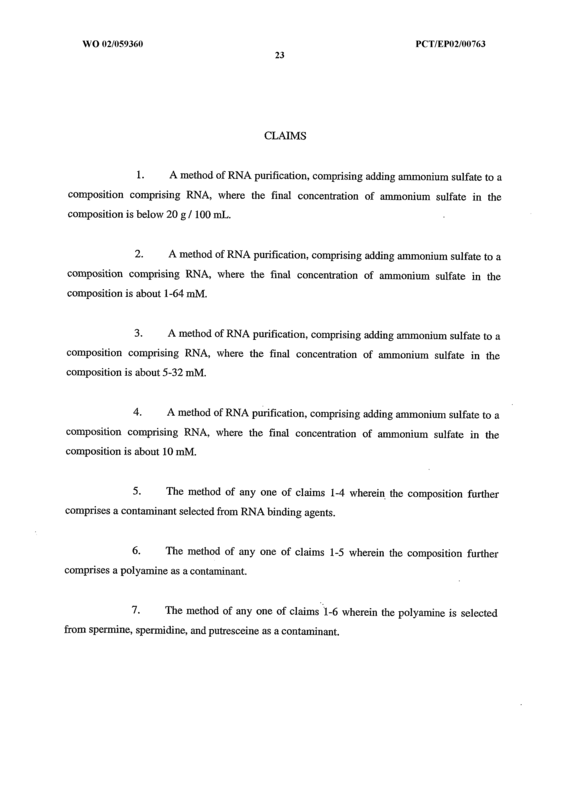 The method of any one of claims 1-10 wherein the composition further comprises actinomycin as a contaminant. 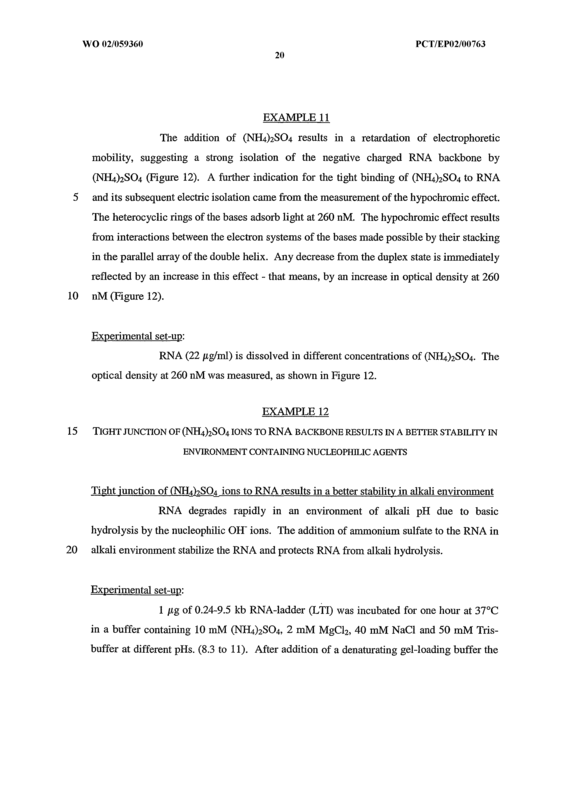 The method of any one of claims 1-11 wherein the composition further comprises charged polysaccharide as a contaminant. 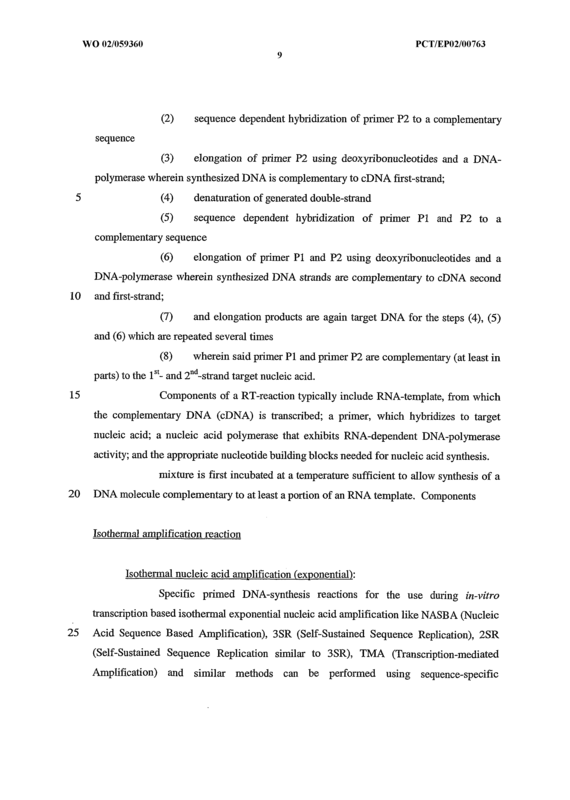 The method of any one of claims 1-12 wherein the composition further comprises glycoprotein as a contaminant. 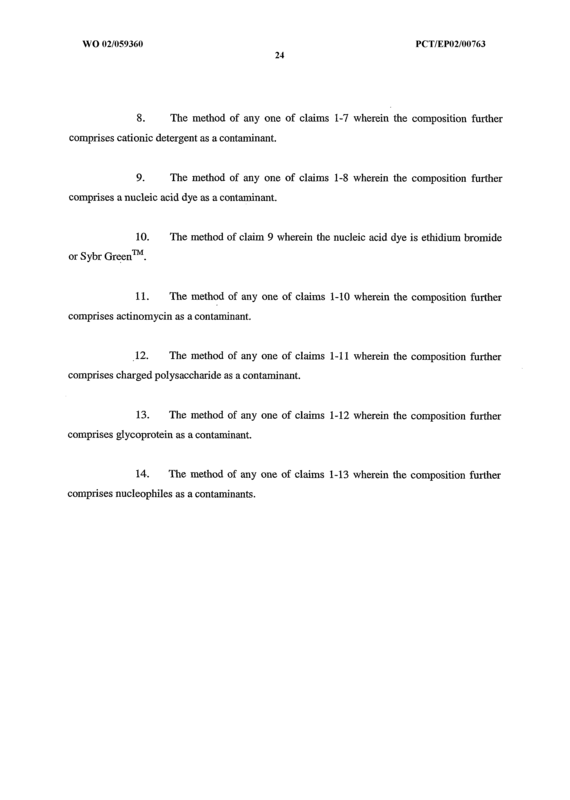 The method of any one of claims 1-13 wherein the composition further comprises nucleophiles as a contaminants.